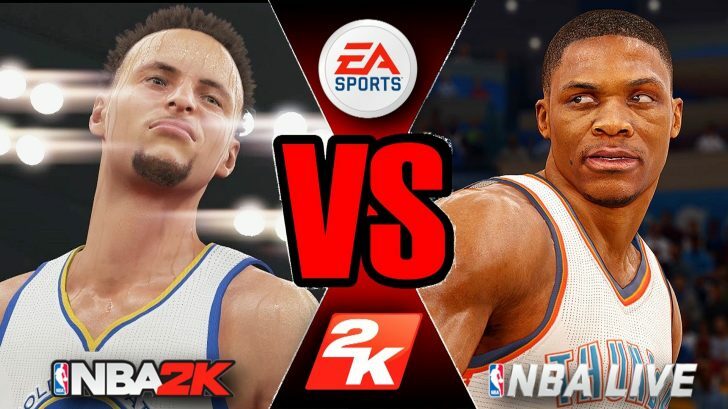 NBA 2K18 Vs. NBA Live 18 Head To Head Review: Which is Better? With the newest releases of the two big basketball franchises this year, we have to wonder: which is the better purchase? Both NBA Live 18 and 2K18 bring the same base content to the table, but we’re going to dig to see what makes each game stand apart and whether one is better than the other.2K18 has continued to show massive promise and success through the years, while Live has been on the backburner of basketball fans’ minds. However, with the new entry in the series, EA Sports is trying to show that they still have some magic outside of Madden. We will categorize both games using the following points: Gameplay, Presentation, Visuals, Audio, and Content. First let’s start with Gameplay. The gameplay for each game is extremely similar, as one would expect on the surface between two basketball games. Not much to iterate on. However, as we dig a little deeper, the mechanics in both games are extremely different. It seems that in NBA Live, you’re bound to make more shots open or contested,compared t0 2K, where you’re prone to miss even open lay ups a lot more, even on a perfect play. Also, NBA Live defense is automapped to one button to make it easier to play, where as in 2K, it would take skill to play on defense. The presentation in NBA Live is leagues better than NBA 2K, as the latter does not seem to iterate upon it’s design, comparatively to NBA Live which attempts to change,most likely due to the lower sales figures. The HUD in game for NBA 2K is similar to TNT’s HUD during basketball games, while NBA Live goes for ESPN’s HUD. The story mode in NBA Live also uses filmed cutscenes of ESPN’s First Take. featuring Stephen A. Smith and Max Kellerman, as well as Basketball’s legendary landmarks,such as Rucker Park and the Drew League. NBA 2K showcases a hub world where players can interact with each other, either in training facilities, get haircuts, and other various activities as well. It feels like the game world has a little more depth to it, which is what 2K has been attempting to work on with each iteration, and 18 does it very well. The lighting and models for NBA 2K, when shown against NBA Live 18, appear less detailed,with a different style of the photorealistic take on the setting. The light reflects off the models in NBA Live, as if the characters were really sweating mid game. The arenas also have a different take on the looks, though because of the lighting in NBA Live makes everything look reflective, it comes off more realistic. However, the animations in NBA 2K 18 stand out a lot more, showcasing a variety of more realistic celebrations that would exist only in today’s society. It is apparent that 2K is built for the current and existing fans of the series, and can potentially pull new people in with it’s arcade looks and style. If you’re a fan of current hip hop music trends, you’ll find that both games sport similar soundtracks,featuring 2Chainz, Kendrick Lamar, and other artists, though 2K has the larger selection of music, sporting around 50 tracks to Live’s 30. With the content being roughly the same, the biggest stand out between the two games is the inclusion of the WNBA in NBA Live. Though you cannot use the ladies teams in other modes or online, it is progress to a more inclusive and whole basketball experience in future NBA Live titles from EA Sports. The One is a decent feature, but compared to NBA 2K18’s Run The Neighborhood, it may feel a bit lacking. Customization for characters in NBA Live is more expansive compared to 2K especially without the need for Microtransactions, though 2K has a deeper GM simulator, sporting cut scenes. Final Result: I must note that NBA Live is a cheaper title as a whole selling 20 dollars cheaper than NBA 2K , so if you’re looking for a basketball fix, but do not want to pay an arm and a leg for cosmetics on top of the game, NBA Live might be your choice. However, if you want a game that you want to improve in skill and enjoy with friends, NBA 2K might be the one for you.